Amber. Aroma is spices, cookie dough, dried figs, sugar icing, lots of belgian yeast, milk chocolate. Taste is harsh green yeast. Quite bitter in the finish. Lots of tree bark. Rather too harsh to drink. Alcoholic and murky. (bottle) very hazy amber colour with a frothy off-white head. aroma of canned peaches and syrup, with a hint of burnt toffee, some cooked peas and wheat. flavour is mostly the same, lots of caramel, rotten peaches and ethanol, very sweet and metallic, with a touch of cardboard in the light-bitter finish. heavy-bodied with lively carbonation. Bottle. Hazy golden color with white head. Aroma is dirty peach, boozy, spicy yeasts. Taste is rotten peach and banana, mineralic. Boozy, sirupy finish. Not convincing. Bottle. Grey cloudy golden, grey lace. Burned sugar, heavy fermented fruit nose, pear, banana, moldy clementine. Medium light body, mellow mouthfeel. Heavy on the dirty fruit and mineral aroma. Clay baked rotten fruit finish. Not pleasant. 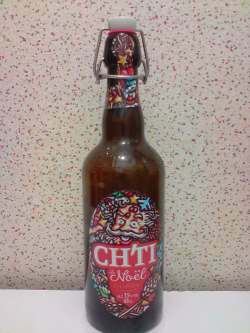 Bottled, 650ml, Swing Cap from a Spar in Maubeuge, Nord Dept., France. With Derek whilst cooking up a Mothers Day Feast. Copper with off white head. This proved to be quite a smooth, malty beer, there is a spiced element here, coriander and a hint of clove we thought. There is a yeasty hint. Fuller on the palate with malty sweetness. Decent beer. 33cl bottle. Apperance: A clear deep blond beer, with a small creamy off-white head. Aroma: sweet, lots of orange peel, apples, overripe fruits, spices, and some sugary.tones. Taste: Sweet, sugary, cooked apples, orange peel and cooked vegetables, spices, cloves, some cinnamon. medium body, below average carbonation. More a Biere de Garde as a Belgian strong Ale. A bit too sweet sugary and spicey, but not too bad. UPDATED: JUL 10, 2018 bottle from E.Leclerc Geispolsheim. Amber golden, tall white head. Full-bodied, syrupy malty base, some arthy hops and a spicy touch.